The time is fast approaching where Ford will unveil the latest incarnation of the 2020 Ford Mustang Shelby GT500, but up until now precious few details have emerged. 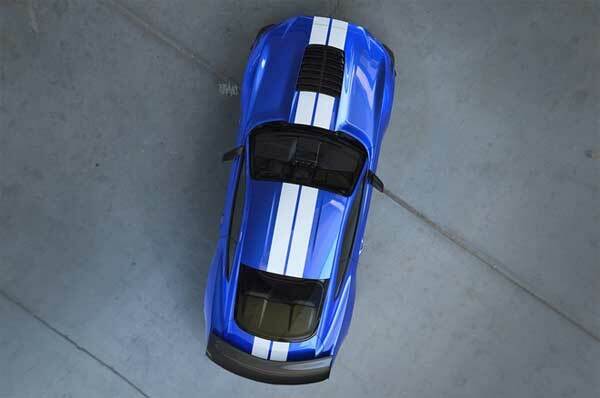 A new rendering now shows the GT500 in full view albeit in a down shot view, to at least give some idea of what’s to come. The signature dual white racing stripes are evident with heat extractor vents located in the hood and possibly sharper lines along the body. As power output is most likely to be knocking on the door of 700hp and a bit beyond, the engine is most likely to be a variant of the 5.2L GT350 flat plane crank V8 with a supercharger. The transmission being a possible 10-speed automatic or seven speed dual clutch setup. The fenders look a little wider, with a front splitter, fixed wing and what looks to be through the rear window no presence of rear seats. this could possibly point out a rear seat delete option being available. We are getting ever closer to seeing what this iconic car is going to be like in its next incarnation with the details of it at least being faster, sharper and more refined than ever before.